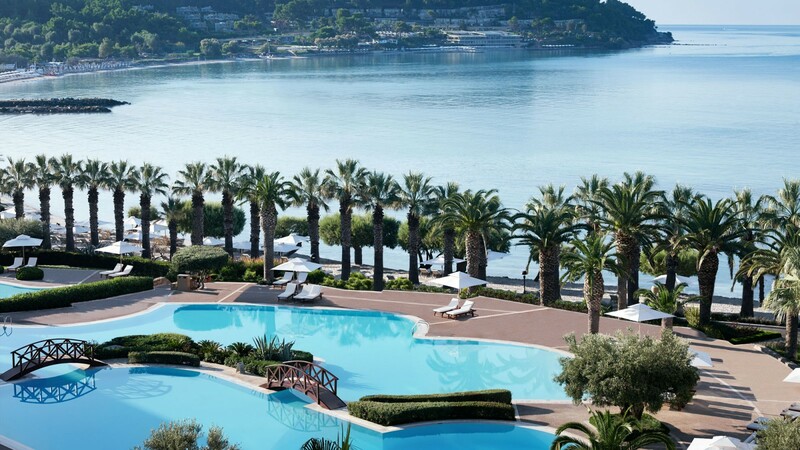 Set on a beautiful bay in Kassandra, IKOS Oceania is a luxurious all inclusive resort set within private gardens overlooking the Aegean. 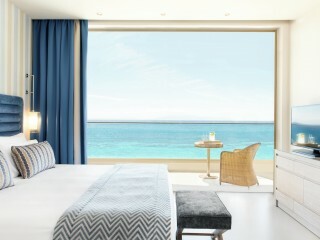 Part of the exclusive IKOS collection, this recently refurbished addition enjoys clean lines and slick modern rooms. 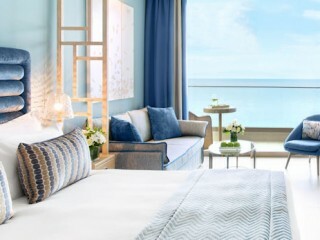 The Oceania is a good value option offering families and couples a complete resort experience while in Greece, and featuring an imaginative new luxury all-inclusive concept (Infinite Lifestyle™). Service and dining are of a very high quality with menus signed by Michelin-starred chefs and as part of the innovative Dine-Out program you can eat in a taverna in nearby Nea Moudania. 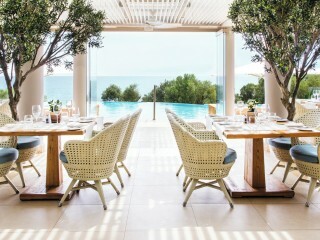 The French and Asian á la carte restaurants feature an al fresco balcony overlooking an infinity pool with ocean and panoramic Halkidiki views. 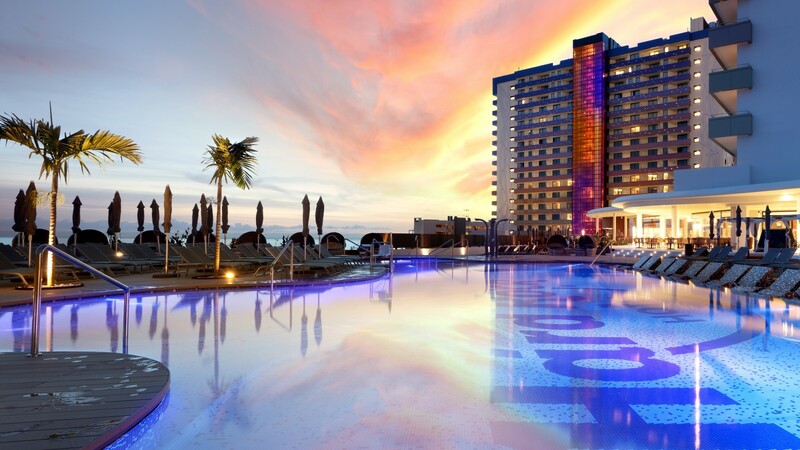 The adults only pool offers a quiet and peaceful area to relax (children under 12 are excluded). 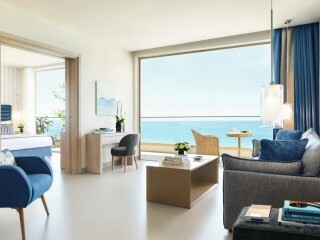 Of special note is the very flexible 24-hour in-room dining and continuous all-day beach and pool service with cocktails, a selection of internationally branded spirits and fine wines to choose from. 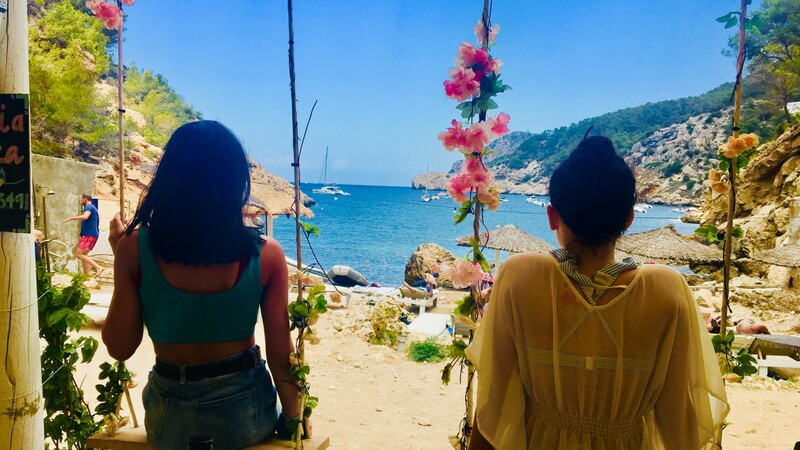 There is also plenty of exciting evening entertainment for night owls such as west-end style shows, beach parties and live music. 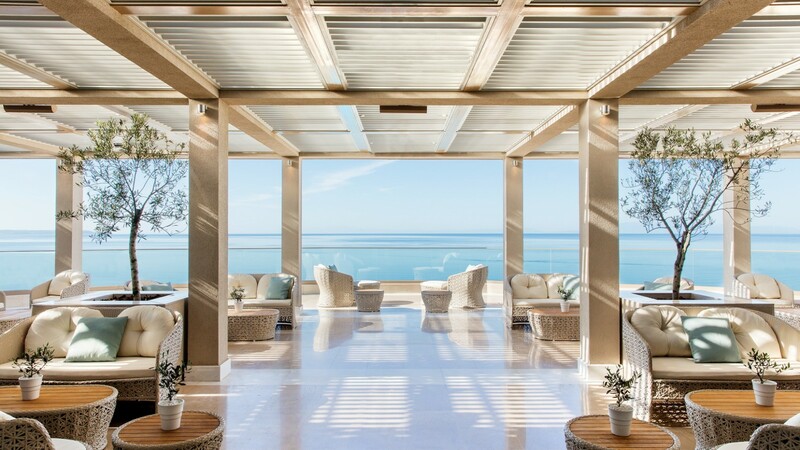 If you want to be pampered during your holiday in Greece, you will love the blissful spa by Anne Semonin whilst thrill seekers can spend their day at the tennis club, mountain biking, new fitness studio or enjoy extensive water sports on the 350-metre pale sandy beach. 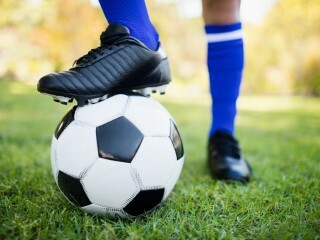 If that is not enough there is also a seasonal football academy, swimming school, diving and daily group activities such as Greek dance lessons or cooking master classes to try your hand at. 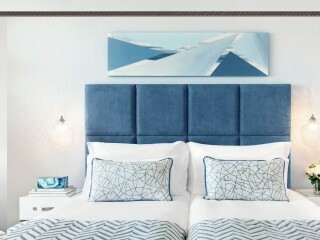 We highly recommend Deluxe Collection rooms which enjoy special privileges such as a dedicated manager, Deluxe Butler service, select check-in and check-out, a special beach dinner, an exclusive beach and pool area with unique snacks and cocktails. 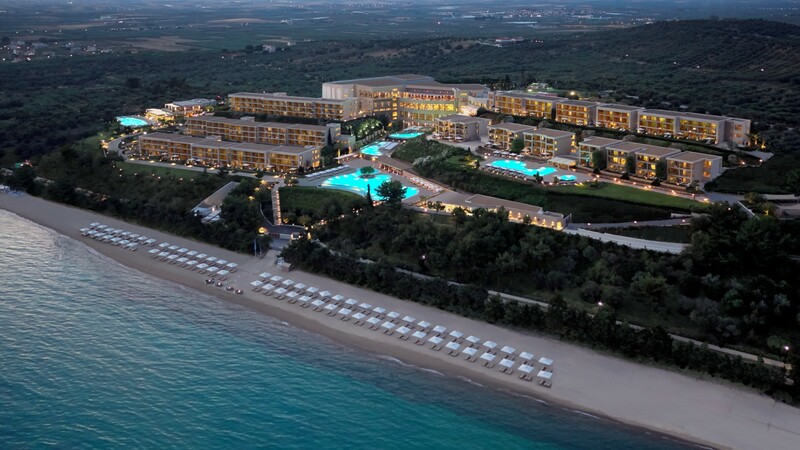 The IKOS Oceania has six bars and four exquisite à-la-carte restaurants as well as one Mediterranean buffet style restaurant delivering exquisite menus, complemented by fine wines and exemplary service. In addition, there is the renowned Dine Out experience introducing you to the best local restaurants. 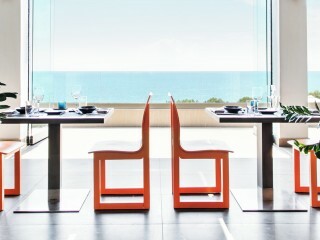 Serves breakfast, lunch, snacks and dinner: Ideal for an à-la-carte dinner with contemporary Greek cuisine. Fresco offers mouth-watering Italian cuisine, this à la-carte restaurant is on the beachfront with both indoor and al-fresco dining. Dinner only. Offers the finest flavours from China, Thailand, India and more feature on the mesmerizing menu at this innovation à la-carte restaurant. Prepare to be impressed. Dinner only. Serves breakfast, lunch and dinner. 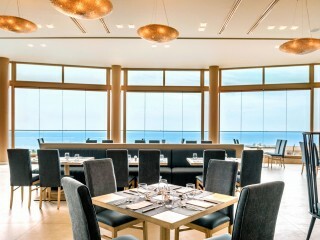 Atmospheric restaurant ideal for à-la-carte lunch and dinner with Provencal cuisine. 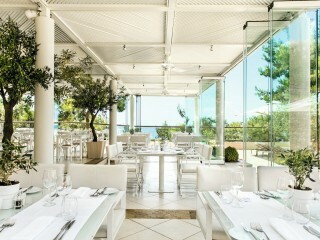 Newly renovated, elegant restaurant with stunning views over the Aegean Sea. Guests can enjoy an extensive Mediterranean buffet for breakfast, lunch and dinner. “Quiet Zone” available. 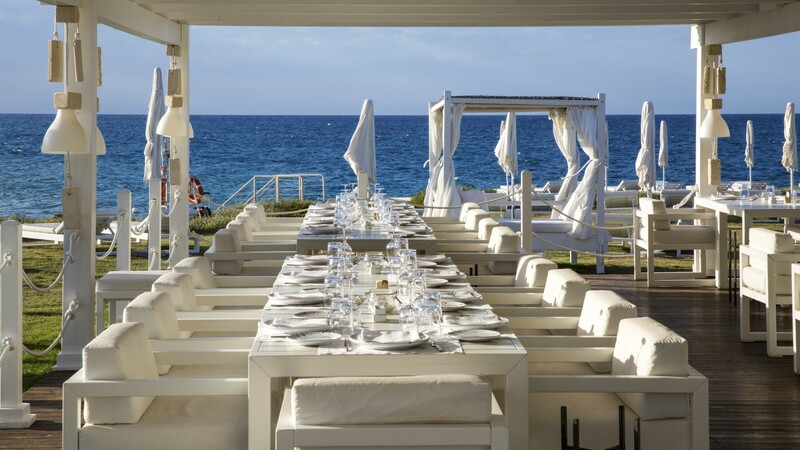 All Ikos Resorts guests can head out to local areas and dine in a specially selected restaurant offering a very tempting choice of traditional Greek dishes. Reservation required. 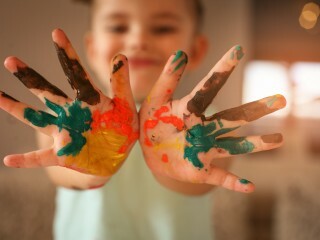 There are lots of different activities offered throughout the different age groups of children such as arts and crafts, sports, cooking, water sports, swimming and games. 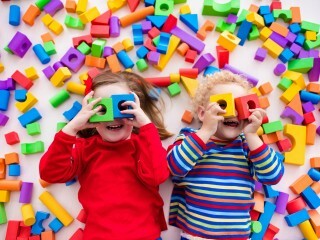 All clubs are operated by UK childcare specialists, Worldwide Kids Company. We highly recommend pre-booking child-care sessions before arriving at the resort. This is to avoid disappointment as spaces are limited due to their strict ratios. Babysitting available on request. Chargeable créche (ages 4 months – 3.99 years) 10am – 1pm (morning session), 1pm – 3pm (lunch session), 3pm – 6pm (afternoon session) at extra charge. (age 12 - 17 years) (high season) (10:00-13:00, 15:00-18:00). Monday–Saturday closing Sunday for Family Day, 10am–12pm ( age 5–8 years) and 5pm–7pm (age 9–14 years), 9:15am – 9:55am Toddler sessions, staff ratio 1:12 between May and August only. 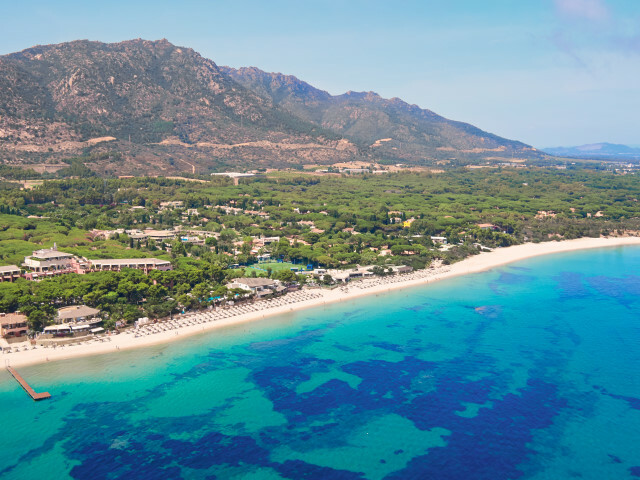 Parents can enjoy their own relaxation time on the beach while the dedicated Beach Childcare staff look after their little ones under a specially designed tent for 30 minutes free of charge. Available for children over 4 years old. This stylish double room (indoor space approx. 30 m2) with furnished terrace features a bathroom with shower, make up mirror and bathrobes, slippers, hairdryer; Wi-Fi, Smart TV with online apps, information system, android and IOS compatible platform, mini bar, Nespresso coffee and tea making facilities, electronic safe, air conditioning/heating. Anne Semonin luxury bathroom amenities. Turndown service. Tile floor. Accommodates two adults. 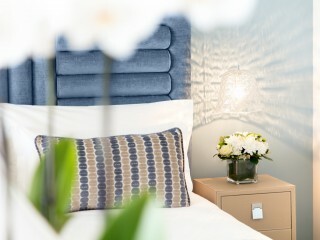 Stylish and comfortable, the Superior Double room (indoor space approx. 30 m2) features a bathroom with bathtub or shower, make up mirror and bathrobes, slippers, hairdryer; Wi-Fi, Smart TV with online apps, information system, android and IOS compatible platform, mini bar, Nespresso coffee and tea making facilities, electronic safe, air-conditioning/heating. Furnished balcony or terrace. Anne Semonin luxury bathroom amenities. Turndown service. Tile floor. Accommodates two adults. Side sea view. Stylish and comfortable, the Superior Double room (indoor space approx. 30 m2) features a bathroom with bathtub or shower, make up mirror and bathrobes, slippers, hairdryer; Wi-Fi, Smart TV with online apps, information system, android and IOS compatible platform, mini bar, Nespresso coffee and tea making facilities, electronic safe, air-conditioning/heating. Furnished balcony or terrace. Anne Semonin luxury bathroom amenities. Turndown service. Tile floor. Accommodates two adults. Sea view. Elegant and spacious (indoor space approx. 35 m2), these suites offer a combined bedroom and living area, bathroom with bathtub or shower, make up mirror, bathrobes, slippers, hairdryer, Wi-Fi, Smart TV with online apps, information system, android and IOS compatible platform, mini bar, Nespresso coffee and tea making facilities, electronic safe, air-conditioning/heating. 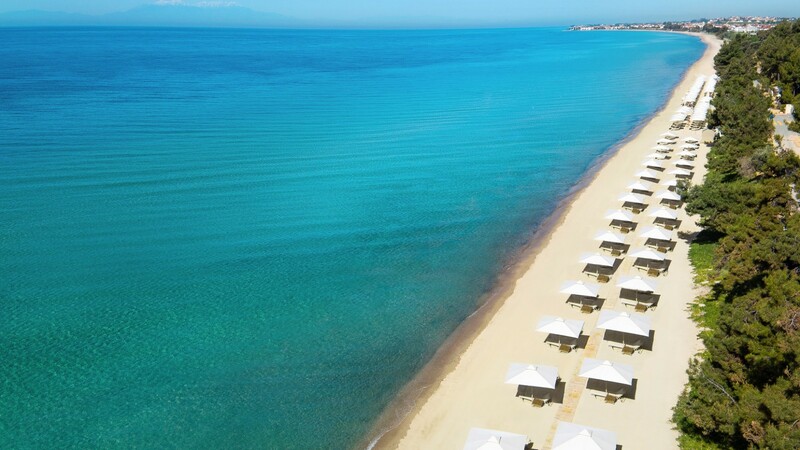 Furnished balcony or terrace with magnificent views over the Aegean Sea and Mount Olympus. Anne Semonin luxury bathroom amenities. Turndown service. Tile floor. Accommodates two adults and one child. Sea view. Elegant and spacious (indoor space approx. 35 m2), these suites with private garden offer a combined bedroom and living area, bathroom with bathtub or shower, make up mirror, bathrobes, slippers, hairdryer, Wi-Fi, Smart TV with online apps, information system, android and IOS compatible platform, mini bar, Nespresso coffee and tea making facilities, electronic safe, air-conditioning/ heating. 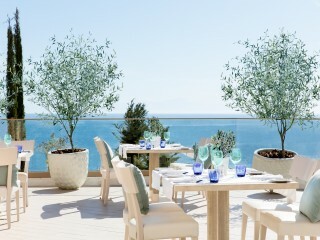 Furnished terrace with private garden with magnificent views over the Aegean Sea and Mount Olympus. Anne Semonin luxury bathroom amenities. Turndown service. Tile floor. Accommodates two adults and one child. Sea view. 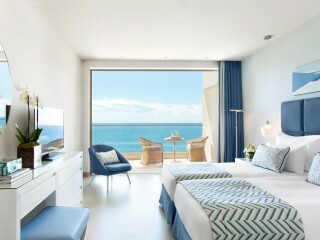 Stylish and comfortable, this room consists of two interconnecting Superior Double Rooms Sea View. Each room features a bathroom with bathtub make up mirror, bathrobes, slippers, hairdryer, Wi-Fi, Smart TV with online apps, information system, android and IOS compatible platform, mini bar, Nespresso coffee and tea making facilities, electronic safe, airconditioning/heating. Furnished balcony with magnificent views over the Aegean Sea and Mount Olympus. Anne Semonin luxury bathroom amenities. Turndown service. Tile floor. Accommodates two adults and two children. Sea view. Total space 60m². This perfectly positioned contemporary suite (indoor space approx. 35 m2) offers magnificent panoramic sea views. 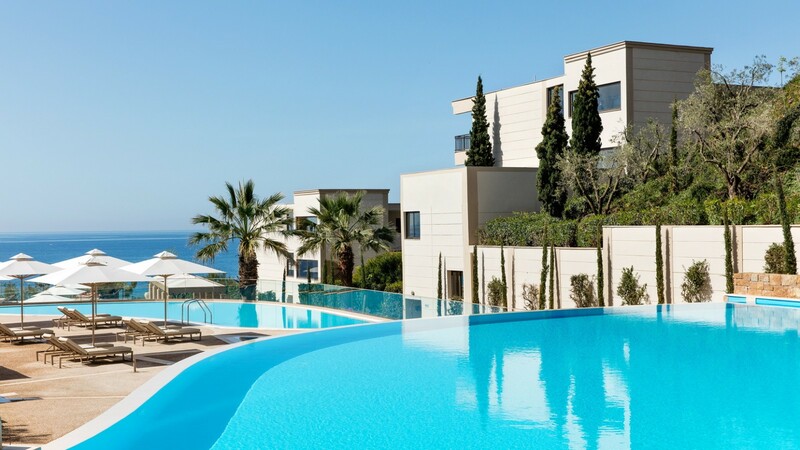 Elegantly styled throughout, it offers an open plan seating area, en-suite bathroom with rain shower, plus a furnished balcony with magnificent views over the Aegean Sea and Mount Olympus. All rooms include make up mirror, bathrobes, slippers, hairdryer, Wi-Fi, Smart TV with online apps, information system, android and IOS compatible platform, mini bar, Nespresso coffee and tea making facilities, electronic safe, air-conditioning/heating. Anne Semonin luxury bathroom amenities. Turndown service. Tile floor. Accommodates two adults and two children. Panoramic Sea view. These ultra-spacious suites (indoor space 48m²) consist of a stylish living area and separate bedroom; a bathroom with bathtub, make up mirror, and bathrobes, slippers, hairdryer; multi-channel satellite television and integrated music channels. Nespresso coffee and tea making facilities. 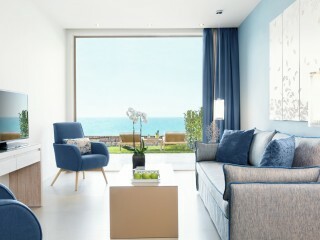 Furnished terrace with two sun loungers and magnificent views over the Aegean Sea and Mount Olympus. Anne Semonin luxury bathroom amenities. Turndown service. Tile floor. Accommodates two adults and two children. Ground Floor location. Sea view. These ultra spacious suites (indoor space approx. 48 m2) with their own private garden consist of a stylish living area and separate bedroom; bathroom with bathtub and shower, make up mirror, slippers and bathrobes, hairdryer, Wi-Fi, Smart TV with online apps, information system, android and IOS compatible platform, mini bar, Nespresso coffee and tea making facilities, electronic safe, airconditioning/heating. Furnished terrace and a private garden with two sunloungers and magnificent views over the Aegean Sea and Mount Olympus. Anne Semonin luxury bathroom amenities. Turndown service. Tile floor. Accommodates two adults and two children. Sea view. Ground Floor location. These elegant junior suites combine a spacious bedroom and living room in one open plan area. 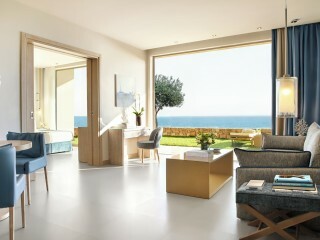 Furnished balcony with magnificent views over the Aegean Sea, Mount Olympus and the private illuminated pool. Bathroom with bathtub and shower, make up mirror, slippers and bathrobes, hairdryer; Wi-Fi, Smart TV with online apps, information system, android and IOS compatible platform, mini bar, Nespresso coffee and tea making facilities, electronic safe, air-conditioning/ heating. Anne Semonin exclusive bathroom amenity selection. Turndown service. Tile floor, indoor space approx. 37 m2. Accommodates two adults and two children. Sea view. Access to Deluxe Collection Pool & beach area. These elegant junior suites (indoor space approx. 37m²) with their landscaped private gardens, combine a spacious bedroom and living room in one open plan area; bathroom with bathtub and shower, make up mirror, slippers and bathrobes, hairdryer; multichannel satellite television and integrated music channels, international direct-dial telephone, mini bar, Nespresso coffee and tea making facilities, electronic safe, air-conditioning/heating. Furnished terrace with private landscaped garden with magnificent views over the Aegean Sea, Mount Olympus and the illuminated pool. Anne Semonin exclusive bathroom amenity selection. Turndown service. Tile floor. Accommodates two adults and two children. Sea view. Access to Deluxe Collection Pool & Beach area. Luxurious in design and richly appointed, these suites (indoor space approx. 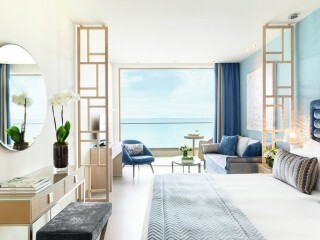 55 m2) feature a spacious living area and separate elegant bedroom, large bathroom with bathtub and shower. Furnished balcony or terrace with sun loungers and spectacular views over the Aegean Sea, Mount Olympus and the private illuminated pool. Facilities include; make up mirror, slippers and bathrobes, hairdryer; Wi-Fi, Smart TV with online apps, information system, android and IOS compatible platform, mini bar, Nespresso coffee and tea making facilities, electronic safe, air-conditioning/ heating. Anne Semonin exclusive bathroom amenity selection. Turndown service. Tile floor. Accommodates two adults and three children. Sea view. These luxurious and extensive suites (indoor space approx. 75 m2) feature an ample dining and living room area, bedroom with individual marble bathroom with bathtub, dressing area, children’s bedroom with individual marble bathroom and shower. Furnished balcony or terrace with magnificent view over the Aegean Sea and Mount Olympus. Facilities also include; slippers, bathrobes, microwave, mini bar, Nespresso coffee and tea making facilities, 3 satellite plasma televisions, 2 hairdryers, electronic safe, air-conditioning/ heating, Anne Semonin exclusive luxury bathroom amenities, Turndown service. Tile floor. Accommodates two adults and four children. Sea view. Access to Deluxe Collection Pool & beach area. The whole experience was exceptional…. The whole experience was exceptional. The service was excellent, The room was of a very high standard and the food and drinks were truly of international standard. We will definitely go there again. !